I’m a firm believer that sometimes you find songs and sometimes songs find you. This one in particular found me last week while in New Orleans—at about 10:30 am—in the midst of nursing a bloody mary. Comprised of the stuff that seems to exist in some sort of twilight netherworld (not unlike Santo & Johnny’s “Sleepwalk“) “Drume Negrita” is culled from Mambo Sinuendo, Ry Cooder’s 2003 collaboration with Havana musician Manuel Galban. 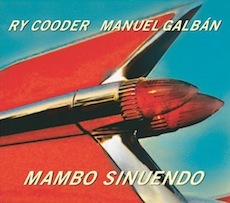 Infinitely more spectral, hoodoo and slinky than anything found on the pair’s previous collaboration, Buena Vista Social Club, “Drume Negrita” was decribed by Cooder as “a sound that had not been explored; a Cuban electric-guitar band that could re-interpret the atmosphere of the 1950s with beauty, agility, and simplicity.” I’d say he nailed it. @allen – re: buena vista, while he wasn’t one of the OG’s, he most certainly was a part of the project. I take that back – he appeared in the movie, because he was recording on one of the other members’ solo albums – but he was not a part of the group, and didn’t appear on the album. I just like the song – a lot! Thanks for posting. Great record. Yeah, as AD mentions, Galban was a part of the film and touring incarnation of BVSC. What another great track for AD! I am definitely going to check out the album. This will certainly find itself in my summer poolside rotation. Great album/tracks. First heard being played over PA during setbreak at a Phish show. They play a lot of great stuff between sets…good background music for ambling around a venue!